In Part 1, we looked at various options to ingest and store sensitive healthcare data using AWS. 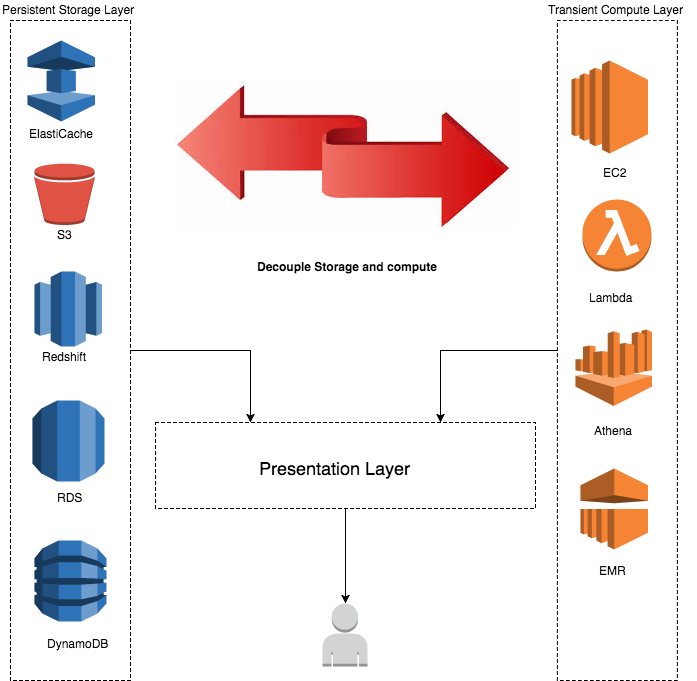 The post described our shared responsibility model and provided a reference architecture that healthcare organizations could use as a foundation to build a robust platform on AWS to store and protect their sensitive data, including protected health information (PHI). In Part 2, we will dive deeper into how customers can optimize their healthcare datasets for analytics and machine learning (ML) to address clinical and operational challenges. There are a number of factors creating pressures for healthcare organizations, both providers and payers, to adopt analytic tools to better understand their data: regulatory requirements, changing reimbursement models from volume- to value-based care, population health management for risk-bearing organizations, and movement toward personalized medicine. As organizations deploy new solutions to address these areas, the availability of large and complex datasets from electronic health records, genomics, images (for example, CAT, PET, MRI, ultrasound, X-ray), and IoT has been increasing. With these data assets growing in size, healthcare organizations want to leverage analytic and ML tools to derive new actionable insights across their departments. All object data is stored in Amazon S3, Amazon S3 Infrequent Access, or Amazon Glacier depending on how often they are used. Data from the provider’s database is either processed and stored as objects in Amazon S3 or aggregated into data marts on Amazon Redshift. Metadata of the objects on Amazon S3 are maintained in the DynamoDB database. Amazon Athena is used to query the objects directly stored on Amazon S3 to address ad hoc requirements. We will now look at two best practices that are key to building a robust analytical layer using these datasets. Separating storage and compute: You should not be compelled to scale compute resources just to store more data. The scaling rules of the two layers should be separate. Leverage the vast array of AWS big data services when it comes to building the analytical platforms instead of concentrating on just a few of them. Remember, one size does not fit all. We optimize our storage. Not having redundant copies reduces the amount of storage required. We keep the data secure with only authorized services having access to it. Keeping multiple copies of the data can result in higher security risk. We are able to scale the storage and compute separately as needed. It becomes easier to manage the data and monitor usage metrics centrally such as how often the data has been accessed, who has been accessing it, and what has been the growth pattern of the data over a period of time. These metrics can be difficult to aggregate if the data is duplicated multiple times. We will do this using a Glue crawler. First create a JSON file that contains the parameters for the Glue crawler. Log on to the AWS Glue console, navigate to the crawlers, and wait until the crawler completes running. This will create two tables — phi and non-phi — in a database named “readmissions” in the AWS Glue Data Catalog as shown below. 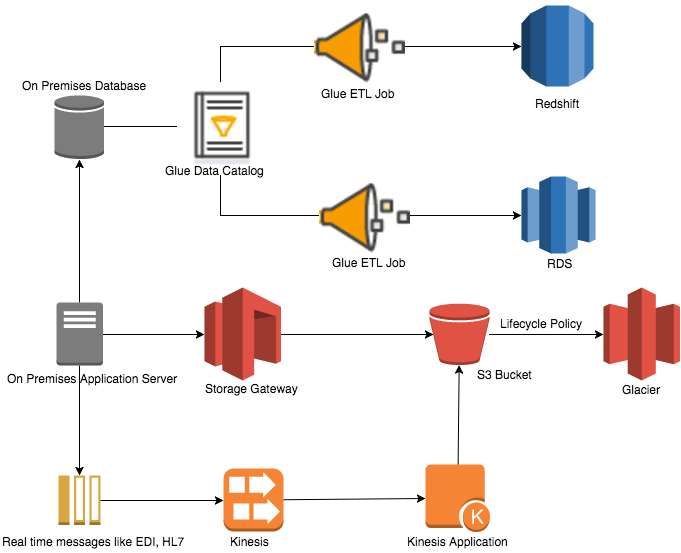 The Amazon Glue Data Catalog is seamlessly integrated with Amazon Athena. For details on how to enable this, see Integration with AWS Glue. As a result of this integration, the tables created using the Glue crawler can now be queried using Amazon Athena. Amazon Athena allows you to do ad hoc analysis on the dataset. You can do exploratory analysis on the data and also determine its structure and quality. This type of upfront ad hoc analysis is invaluable for ensuring the data quality in your downstream data warehouse or your ML algorithms that will make use of this data for training models. In the next few sections, we will explore these aspects in greater detail. To query the data using Amazon Athena, navigate to the Amazon Athena console. NOTE: Make sure the region is the same as the region you chose in the previous step. If it’s not the same, switch the region by using the drop-down menu on the top right-hand corner of the screen. What were the top 5 specialties with positive readmissions? While this information is valuable, you typically do not want to invest too much time and effort into building an ad hoc query platform like this because at this stage, you are not even sure if the data is of any value for your business-critical analytical applications. One benefit of using Amazon Athena for ad hoc analysis is that it requires little effort or time. It uses Schema-On-Read instead of schema on write, allowing you to work with various source data formats without worrying about the underlying structures. You can put the data on Amazon S3 and start querying immediately. Now that we are satisfied with the data quality and understand the structure of the data, we would like to integrate this with a data warehouse. We’ll use Amazon Redshift Spectrum to create external tables on the files in S3 and then integrate these external tables with a physical table in Amazon Redshift. Amazon Redshift Spectrum allows you to run Amazon Redshift SQL queries against data on Amazon S3, extending the capabilities of your data warehouse beyond the physical Amazon Redshift clusters. You don’t need to do any elaborate ETL or move the data around. 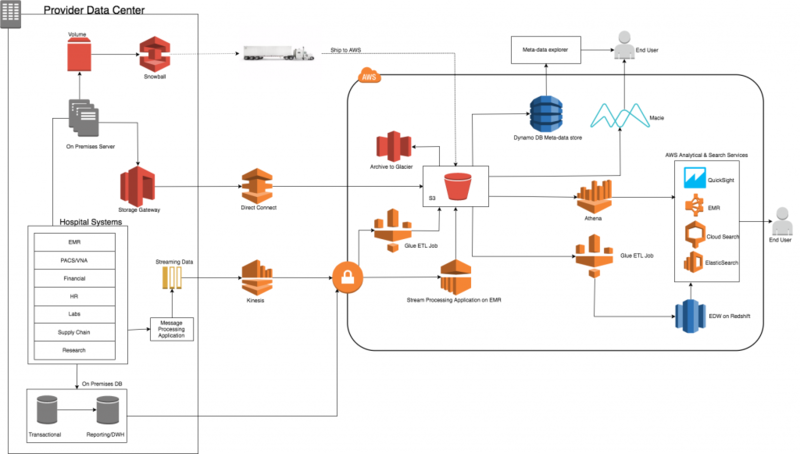 The data exists in one place in Amazon S3 and you interface with it using different services (Athena and Redshift Spectrum) to satisfy different requirements. Before beginning, please look at this step by step guide to set up Redshift Spectrum. NOTE: Make sure you select the appropriate role arn and region. You should see a row similar to the one above with your corresponding region and role. You should see 101,766 rows in both the tables, confirming that your external tables contain all the records that you read using the AWS Glue data crawler and analyzed using Athena. We can now create dashboards to visualize the data in our readmissions aggregate fact table using Amazon QuickSight. Here are some examples of reports you can generate using Amazon QuickSight on the readmission data. For more details on Amazon QuickSight, refer to the service documentation. 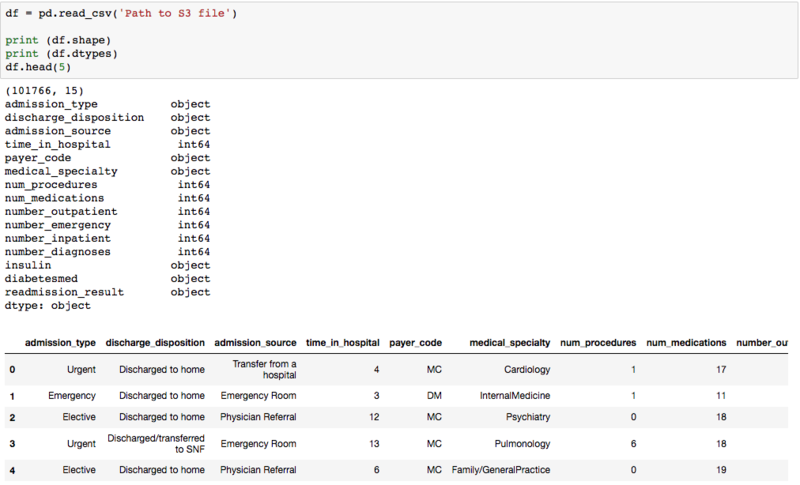 As a final step, we will create a ML model to predict the attribute readmission_result, which denotes if a patient was readmitted or not, using the non-PHI dataset. Create a notebook instance in Amazon SageMaker that is used to develop our code. The code reads non-PHI data from the Amazon S3 bucket as a data frame in Python. This is achieved using the pandas.readcsv function. Use the pandas.get_dummies function to encode categorical values into numeric values for use with the model. Split the data into two, 80% for training and 20% for testing, using the numpy.random.rand function. Form train_X, train_y and test_X, test_y corresponding to training features, training labels, testing features, and testing labels respectively. 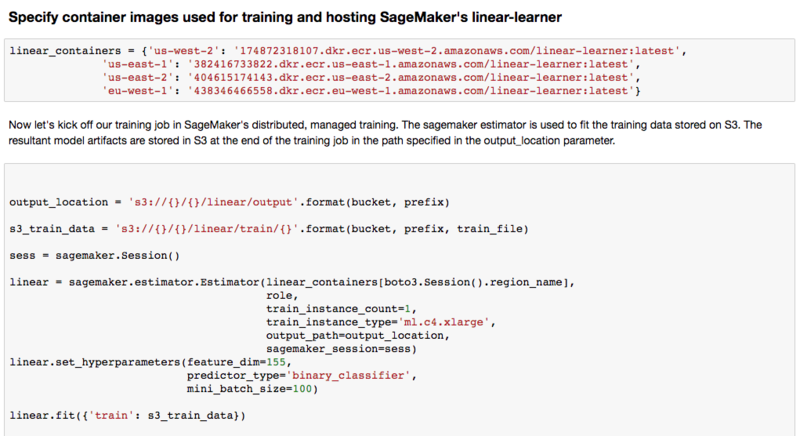 Use the Amazon SageMaker Linear learner algorithm to train our model. The implementation of the algorithm uses dense tensor format to optimize the training job. Use the function write_numpy_to_dense_tensor from the Amazon SageMaker library to convert the numpy array into the dense tensor format. Create the training job in Amazon SageMaker with appropriate configurations and run it. Once the training job completes, create an endpoint in Amazon SageMaker to host our model, using the linear.deploy function to deploy the endpoint. Finally, run a prediction by invoking the endpoint using the linear_predictor.predict function. You can view the complete notebook here. Data, analytics, and ML are strategic assets to help you manage your patients, staff, equipment, and supplies more efficiently. These technologies can also help you be more proactive in treating and preventing disease. Industry luminaries share this opinion: “By leveraging big data and scientific advancements while maintaining the important doctor-patient bond, we believe we can create a health system that will go beyond curing disease after the fact to preventing disease before it strikes by focusing on health and wellness,” writes Lloyd B. Minor, MD, dean of the Stanford School of Medicine. ML and analytics offer huge value in helping achieve the quadruple aim : improved patient satisfaction, improved population health, improved provider satisfaction, and reduced costs. Technology should never replace the clinician but instead become an extension of the clinician and allow them to be more efficient by removing some of the mundane, repetitive tasks involved in prevention, diagnostics, and treatment of patients. (1) “The Digital Future of Pathology.” The Medical Futurist, 28 May 2018, medicalfuturist.com/digital-future-pathology. (2) Wang, Dayong, et al. “Deep Learning for Identifying Metastatic Breast Cancer.” Deep Learning for Identifying Metastatic Breast Cancer, 18 June 2016, arxiv.org/abs/1606.05718. Stephen Jepsen is a Global HCLS Practice Manager in AWS Professional Services.